Electronic Arts Inc. and Hothead Games™ have unleashed the T-rated DeathSpank: Thongs of Virtue (T.O.V. ), making it available first for the PlayStation®Network on September 21 for $14.99. Those of us who are Xbox LIVE® Arcade users will have to wait until September 22, when we can grab the expansion for 1200 Microsoft Points. The follow-up to last summer’s award-winning, chart-topping action RPG, DeathSpank: T.O.V. is a fresh new adventure where players hack, slash and shoot their way through mission after mission, in search of the six mystical thongs that are corrupting the universe. Gamers who download DeathSpank: T.O.V. in its first week (see below) will also receive two pieces of free downloadable content, the Snowy Mountain Dungeon, which adds another layer of gameplay and Sidekick Tankko, a cute-and-cuddly ogre who is available as a playable co-op character. DeathSpank: T.O.V. puts players in the mighty boots of DeathSpank in his quest to destroy the six mystical thongs which have corrupted those who wear them, and thus the universe. 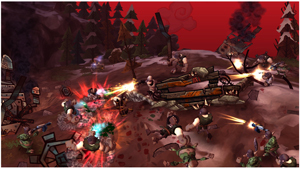 Players will travel through war-torn country sides, outer space and even the North Pole in an epic battle against an Evil Santa, collecting tons of loot along the way. DeathSpank T.O.V. also includes a local co-op mode, allowing a second player to help in the search for the thongs with either of his two trusty sidekicks, Sparkles the Wizard or Ninjatastic Steve. Owners of DeathSpank: T.O.V. on Xbox Live Arcade will be able to download both the Snowy Mountain Dungeon and Sidekick Tankko DLC for free from September 22 – 28. After that time period is over, the Snowy Mountain Dungeon will be available for 240 Microsoft Points and Sidekick Tankko will be available for 80 Microsoft Points. Owners of DeathSpank: T.O.V. on PlayStation Network will receive both pieces of DLC when downloading the main game on PSN from September 20 – 27 (or September 22 – 28 depending on when the game is available in certain regions). After that time period is over, the Snowy Mountain Dungeon will be available for $2.99 and Sidekick Tankko will be available for $0.99. THQ Inc. today announced that it has selected Joyent, a global provider of smart computing solutions with an office in Vancouver , to support THQ’s expanding presence in the social games space. THQ will use Joyent’s innovative Smart Technologies to provide a turn-key development and publishing environment to its social gaming development teams. Joyent will provide the server infrastructure, bandwidth, hosting and network operations that enable rapid prototyping and deployment of online games. 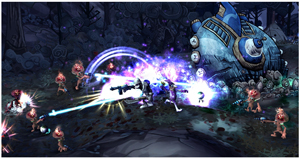 Joyent’s quick-start cloud solution and professional services will enable THQ’s developers to focus on game innovation rather than infrastructure deployment. The application of Joyent technology will allow THQ to speed time to market, lower operating costs and improve scalability. Incidentally, Joyent’s Water Street studio in Vancouver does have career positions open. According to their site, Joyent is looking for a Software Engineer, a Senior Network Engineer and a Sys Admin. On the night of September 12th, Toronto’s McCaul St was egregiously quiet. 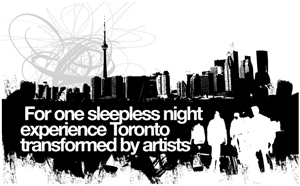 Within the walls of OCADU, however, Interactive Ontario’s IN|2010 was enjoying a strong beginning. The room, sparsely lit and ultimately subdued in atmosphere, was party to a broad assortment of digital media pioneers. The occasion was particularly blessed with its concurrence to the opening of START. Ian Kelso, the President and CEO of Interactive Ontario, described the evening best in his greeting to the crowd. Remember the golden age of video arcades? The clatter of clanging tokens, 8-bit bleeps and the cheers of caffeine-fuelled competitors? Waiting patiently in line to shatter your best friend’s high score on your favourite game? The Arcadian Renaissance — an interactive installation for the upcoming Scotiabank Nuit Blanche Arts Festival — will capture that same boisterous spirit of competition and camaraderie while featuring the best of the Toronto indie gaming scene. But without the wasted quarters and the faint smell of nerd sweat. Scotiabank Nuit Blanche, the celebrated all-night arts festival, is partnering with the Hand Eye Society to feature six vintage arcade consoles that have been modified to play games by local developers. Starting at sundown on October 2, the exhibit will be featured in the atrium of the TIFF Bell Lightbox, the newly opened headquarters of the Toronto International Film Festival. The Hand Eye Society’s “Torontron” arcade cabinet has been seen at the Toronto Comic Arts Festival, the Flash in the Can Festival and most recently, FanExpo. Five more Torontron-style cabinets have been built especially for the Scotiabank Nuit Blanche event, thanks to support from local game companies Metanet, Spyeart, RSBLSB and Untold Entertainment, and the Ontario Media Development Corporation. The featured games were chosen to reflect Toronto’s vibrant indie gaming scene: highly accessible yet artistically sophisticated — and fast enough to play so that everyone gets a turn. The Arcadian Renaissance is expected to be a popular attraction for the city’s tech-savvy citizenry at the all-night event that drew over a million visitors in 2009. Visitors can check out The Arcadian Renaissance at 350 King St. W. on October 2, 2010. The exhibit will run from 6:57 p.m. until sunrise, with a special midnight tournament of Nidhogg, a swordfighting game by celebrated Brooklyn-based indie developer Mark “Messhof” Essen, shown on the big screen. After many weeks of teasing on a series of Assassin’s Creed comics and the recent call for submissions of an upcoming Assassin’s Creed artbook, Ubi Workshop officially opened for business earlier this week. For the launch, four series of high-quality lithographs of Ubisoft games’ artworks are available for collectors in very limited editions. A Red Steel tryptic and a series on Assassin’s Creed are currently on sale. New series from various Ubisoft brands will be regularly added. Ubi Workshop is a group located within the Ubisoft Montreal Studio among the development teams bringing the universes of Ubisoft brands to different medias such as comics, short movies, artbooks, limited editions of artworks, more of which will be available in the near future. Coinciding with the release of the Mob4Hire platform Version 4.2, Mob4Hire announced today that its online community has exceeded 50,000 mobile testers (a.k.a. “mobsters”) from 152 countries with handsets on 389 different network operators. The Mob4Hire community also includes more than 1,600 mobile app developers and market researchers from 88 countries. The award-winning Mob4Hire community puts mobile developers and a global community of tech-savvy testers together in a marketplace for mobile testing, product feedback and market research. Mob4Hire is experiencing a rapid increase in the number of mobile functional and usability testing projects due to the growing demand driven by the explosion of the mobile app and smartphone industry. Mob4Hire’s customer base has grown substantially with both new mobile brands as well as larger traditional brands. Some of the 1,600+ companies registered in Mob4Hire include Verisign, BBC World Trust, IMMI, O2, Truphone, Yellow Pages, MTV Brazil, Vringo and Whompster. By using Mob4Hire, project costs for developers can be reduced by 65% to 90% over traditional methods. Score Media Inc. has acquired 20% of NuLayer Inc., one of Canada’s most innovative software development firms. As part of the transaction, Score Media and NuLayer entered into a multi-year technology development agreement. The deal with NuLayer, creators of the recently launched app theScore iPad Edition, brings enhanced technology development capabilities to Score Media and facilitates theScore’s continued ability to be first to market with cutting-edge offerings for sports fans around the world. The agreement gives NuLayer additional resources to build disruptive technology solutions for both theScore and other forward-thinking organizations and provides the company with the ability to continue to develop and grow their own suite of innovative products, including Crowdreel.com, a social media photo sharing application that delivers real-time access to images posted on Twitter. “Our mobile, web and iPad platforms are growing exponentially and we are constantly looking for new, creative ways to further engage our fans. NuLayer understands our vision and through this investment, we’ve now created an environment where NuLayer and Score Media can continue to work together to develop innovative digital offerings while giving NuLayer the resources they need to achieve explosive growth,” says Benjie Levy, Executive Vice President and Chief Operating Officer, Score Media Inc.
NuLayer specializes in creating custom software applications and has been recognized as one of Canada’s most innovative development firms. Creators of theScore iPad Edition, one of the first free sports apps on the market, and recently touted by the Globe and Mail as one of three Toronto-based tech companies “at the hub of the iPad revolution,” NuLayer is the brains behind several mobile and web solutions such as Crowdreel.com, a social media photo sharing application already used on theScore.com. Congratulations to development studio Digital Extremes who has been named as a winner of The Ontario Business Achievement Awards Royal Bank Award for Small Business. Digital Extremes is one of a dozen Ontario companies who have been named provincial winners of The Ontario Business Achievement Awards (OBAA) and the Ontario Global Traders Awards (OGTA) by the Ontario Chamber of Commerce. Square Enix revealed today that a new premium-quality action figure based on the central character from the Eidos Montreal game Deus Ex: Human Revolution™, Adam Jensen will be the latest addition to the Play Arts® -KAI- series, and will feature newly-augmented Adam Jensen and even more. For those on the career hunt, Eidos Montreal has several positions open, including that for a Brand Manager. Ludia and FremantleMedia Enterprises have launched The Price Is Right HD for iPad® on the App Store. Now iPad users can “COME ON DOWN!” to an unparalleled The Price Is Right experience, enhanced with stunning new HD graphics and incorporating Multi-Touch game play. Incorporating all the familiar elements of the beloved TV game show, The Price Is Right HD for iPad puts players in Contestant’s Row to bid on items in order to earn a shot at playing popular pricing games, try their luck at spinning The Big Wheel, and experience the winner-takes-all tension of the Showcase. * Eye-popping HD graphics designed and optimized for the iPad. 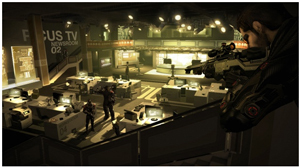 * Two game modes: single player and multiplayer. * Favorite pricing games to play including Plinko, Cliff Hangers, Punch-a-Bunch & many more. * Authentic stages, Big Wheel, and other game elements combine with familiar music and Rich Fields as announcer to create a true-to-show experience. * Customizable 3D player avatars: choose hairstyles, clothing, accessories and more. * Unlock bonus items as a reward for progress in the game. Astral Media Inc. has launched a campaign that celebrates its contributions to Canadian culture. The two TV messages were conceived by Bos and depict what the film, television and music industries would look like without such crucial financing. Both situations use humor to offset an otherwise very serious issue. The campaign premiered last week at the opening night of the Toronto International Film Festival, which Astral is a proud sponsor. One of the two trailers was showcased during the Opening Night Gala Presentation of Score: A Hockey Musical, one of 19 Astral supported Canadian Films selected for the 2010 Festival. Other movies include gala presentations of Barney’s Version, A Beginners Guide to Endings, and the Bang Bang Club; and a special presentation of Trigger. Both messages are now airing on Astral’s pay-television and specialty services. For over 25 years now, Astral has played a leading role in providing private funding for Canadian culture. This dedication to the vitality of our communities and to the arts industry has allowed for ambitious television and film projects to see the light of day, and for now popular musical notes to take flight. Every year, through its pay and specialty TV channels, radio stations and The Harold Greenberg Fund, Astral invests over $170 million in Canadian culture. “We are fortunate to live in a dynamic, inclusive and creative culture. This unique point of view needs to be nourished and celebrated. We take much pride in the fact that Astral’s investments help great projects come to life, contribute to a creative product of quality, and support the talented artists and artisans behind these projects,” said Derev Antikacioglu, Corporate Marketing Director at Astral. Astral continues to be the country’s largest private investor in Canadian feature film, funding the development and production of homegrown film and television projects. In the world of music, Astral has worked closely with partners to develop and launch over 20 projects to support Canadian singers, songwriters and performers. 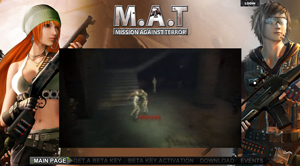 Canadian publisher Wicked Interactive has announced that after an explosively successful closed beta, which Beta Gratis awarded an 8/10 for its gameplay, the free-to-play, online first-person shooter Mission Against Terror (M.A.T.) begins open beta on Sunday, September 19 at 3:00pm EDT sharp. The open beta, hosted by Wicked Interactive’s SUBA Games platform, will allow gamers to be the first in North America to experience this exciting new title, which has been updated and enhanced thanks to the helpful input of everyone who participated in the closed beta, which ends this week. No, this news isn’t remotely Canadian, but I feel that educators, studios, associations and our government should take note, because Canada needs a programme just like this one, and I believe the initiatives behind the American STEM Challenge closely mirror those currently being investigated through the Canada 3.0 Forum, Canada’s Digital Economy and Teaching with Technology. There have been several weeks’ worth of talk shows about the state of the Canadian educational system on Vancouver’s talk radio station CKNW, and a programme such as the STEM Challenge is but one creative way of trying to improve what and how our children are taught. There are many, many worthy programmes in Canada dedicated to making education not only fun and relevant, but also to keeping up with technology; here is a way to unite all of these initiatives in ways that would not only benefit our children, but our economic future, and I feel this is worth further investigation. President Obama announced today the launch of the National STEM Video Game Challenge at a White House event as part of the national “Educate to Innovate” campaign. The Challenge aims to motivate interest in science, technology, engineering, and math (STEM) learning by tapping into students’ natural passion for playing and making video games. The first annual competition is being held by the Joan Ganz Cooney Center at Sesame Workshop and E-Line Media in partnership with sponsors AMD Foundation, Entertainment Software Association and Microsoft. Founding outreach partners include the American Library Association, Boys & Girls Clubs of America, The International Game Developers Association and BrainPOP. * The Youth Prize aims to engage middle school students (grades 5 through 8) in STEM learning by challenging them to design original video games. The Challenge will be open to students from any U.S. school with a special emphasis on reaching students in underserved urban and rural communities. The total prize pool will be $50,000. The winners will receive AMD-based laptops, game design books, and other tools to support their skill development. Cash prizes and educational software will also be awarded to the winning students’ sponsoring organization with additional prize money for underserved communities. * The Developer Prize challenges emerging and experienced game developers to design original games for young children (grades pre-K through 4) that teach key STEM concepts and foster an interest in STEM subject areas. The Challenge will feature a special prize for developers actively enrolled in an undergraduate or graduate program in the U.S. Special emphasis will be placed on technologies that have high potential to reach underserved communities, such as games built for basic mobile phones that address urgent educational needs among at-risk youth. Developers will be competing for a grand prize of $50,000. Two prizes of $25,000 each will be awarded to the top entry submitted on the collegiate level, as well as the top entry for reaching underserved communities. The National STEM Video Game Challenge will accept entries from October 12, 2010 through January 5, 2011. Complete guidelines and details on how to enter are available at www.cooneycenterprizes.org and at www.stemchallenge.org/youthprize. Game-based learning has emerged as one of the most promising areas of innovation in making critical STEM skills more engaging for America’s youth. Research has demonstrated that playing and making video games fosters the development of critical thinking and design skills, problem-solving and builds motivation for pursuing STEM related subjects and careers. The competition responds to major national educational challenges including inadequate skill levels in the workplace and an ever-widening achievement gap between the U.S. and other developed nations, especially in STEM skills.